Jason Holder is unarguably Windies' most crucial player in the Test format. The 26-year-old, who missed out on the first Test against India due to an ankle injury, has already made his presence felt in the second Test in Hyderabad. He first scored a handy 52 with the bat and then followed it up with 5 for 56 to keep Windies in the hunt. It was because of his effort the visiting side have managed to restrict India's lead to 56 runs. Holder has had a phenomenal 2018. The right-arm seamer has picked up 33 wickets in six Tests in 2018, which is the fourth highest tally by a pacer this year. Holder has operated at an unbelievable average of 11.87 - the best by any bowler this year. He had a bowling average of 38.52 before the start of this year which has now gone down to 28.30. Holder, who has total of 86 scalps since his debut in 2014, has taken 39.75% of his career wickets in 2018. Interestingly, all of his fifers have come against the Asian sides. He is only the eighth captain to score 300 runs and take 30 plus wickets in a calendar year in Tests. Holder has found good support from Shannon Gabriel, who took 3 for 107 in this innings, and Kemar Roach. While there have been other pacers who have chipped in, it's mostly been this trio who caused the most damage. Windies have taken 84.02% wickets off the team’s 133 wickets this year. Even Gabriel and Roach have had a very good year, picking up 32 and 16 wickets respectively. This is the fifth time Holder has taken five or more wickets in a Test innings. However, four of them have come in 2018 and he is the only bowler to do that. All of his five five-wicket hauls (one six-fer) has come as skipper and now sits at the third spot in the list of the pacer captains with most number of fifers in this format. * Holder is the first ever visiting skipper to score a 50 and take a five-wicket haul in the same Test in India. 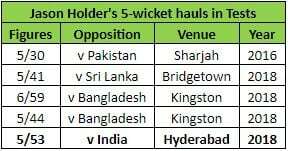 * Holder is the first visiting pacer to taken a five-wicket haul in India since 1994. * He averages 39.62 with bat this year compared to his overall average of 30.70.